Liferay plugins development with MAVEN is also great choice for liferay developers. MAVEN is project build tool like ANT but its has more features than ANT when we build projects using MAVEN. 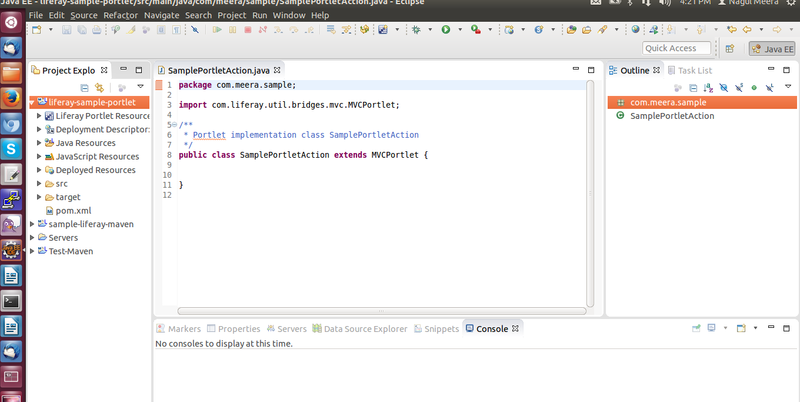 Each Maven project consist pom.xml in project root directory where we will defined project build process. POM is project object model is one of the build process system which describes about software project and POM will be specified as xml tag notation in pom.xml file. pom.xml is blueprint of the project and it describes your project’s directories, required plugins, build sequence, and dependencies. The POM is your project’s sole descriptive declaration. Once you create the pom.xml file and invoke the build process. Maven provides an easy way to share artifacts (e.g., JARs, WARs, etc.) across projects via public repositories. Liferay plugins SDK provides project templates to build sample Plugin applications in the same way Liferay provides maven archetypes from which we can create different sample liferay plugins applications. Archetypes are the template of project structure and it consist of all required configurations,its files and directory structure. We can have different archetypes like spring archetypes,struts archetypes and web application archetypes from this we can create basic project structure from there we can start development. Same way liferay also have created different archetypes for each Plugin type so that we can create basic Plugin projects very easy. 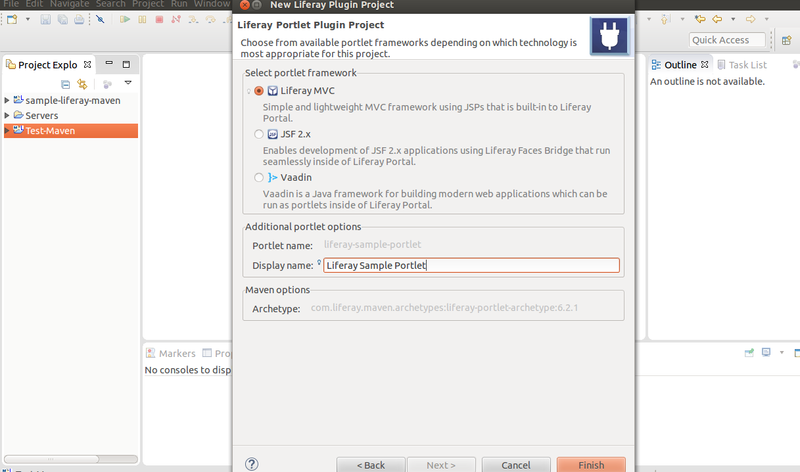 Liferay Java based portal so first we need to install Java in our machine download JDK 1.6 or later version and install. we need to set important environment variables such as JAVA_HOME and need to edit path system variable and add java bin path(;%JAVA_HOME%/bin;). We need Java 6.0 JRE or greater. We are using MAVEN based project building so first we need install MAVEN in machine and we also need to set environment variable like MAVEN_HOME/M2_HOME and edit the path then append MAVEN bin path. Select Start, then right-select Computer --> Properties. In the Advanced tab, click Environment Variables…. Once we created two maven environment variables now we need to edit windows PATH variable then append Maven bin folder like ;%M2_HOME%\bin; so that you can run the Maven’s command everywhere. In the System variables section, select your PATH variable and click Edit…. Append ;%M2_HOME%\bin; end of the existed path. Now open windows command prompt then type following command then will shows maven version message otherwise there is problem in installation so need to recheck all steps. semicolon in the path will separate the different path values so we should not forget to use semicolon. Run command sudo apt-get install maven, to install the latest Apache Maven. It will take time to install all maven packages once it successfully done Run command mvn -version to verify your installation. bash.bashrc file will be available in /etc/bash.bashrc folder open in editor and add following configurations. First we need to download portal server bundle based on developer choice. Once we downloaded bundle archive file then extract it in you desired location then you can see portal server bundle that consist application server with deployed liferay portal. Liferay Portal Server is actual environment to run liferay Plugin applications. Liferay Portal Run time come up with different application servers such as tomcat,jboss,glashfish, jetty, geromino, JOnAS and resin. Liferay provided these run time bundle with different server so that we can use any one based on developer choice. Assume we will use tomcat bundle so download liferay-portal-tomcat-6.2-ce-ga2.zip from above location. Now extract zip file in of your desired location now we are ready with liferay portal tomcat server. Liferay Server Bundle Consist Application server and Deployed Liferay Portal Application. When we observed server deployment directory(for tomcat/webapps) we can see deployed Liferay Portal application with name ROOT. 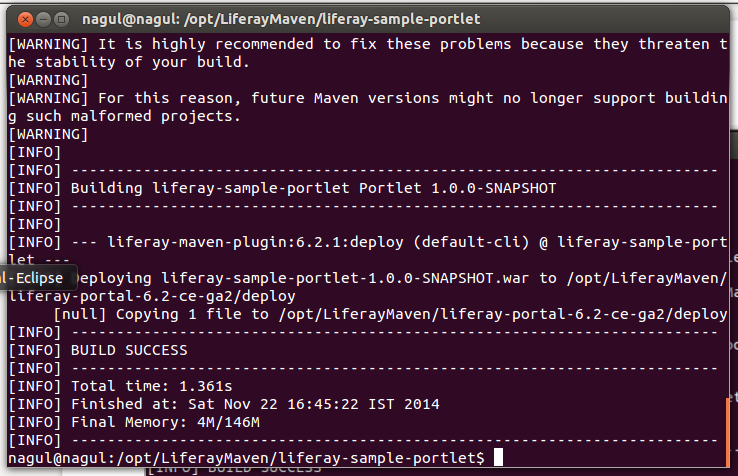 We are developing plugins with maven so we need to install liferay maven archetypes. 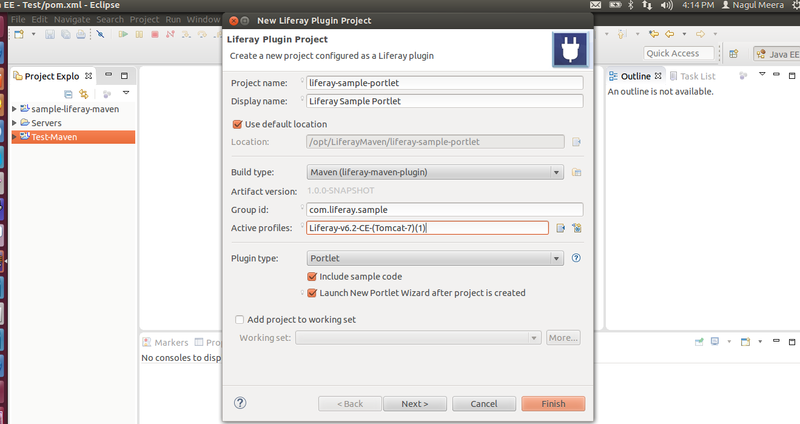 Liferay maven archetypes are like project templates consist all required configurations and its files. 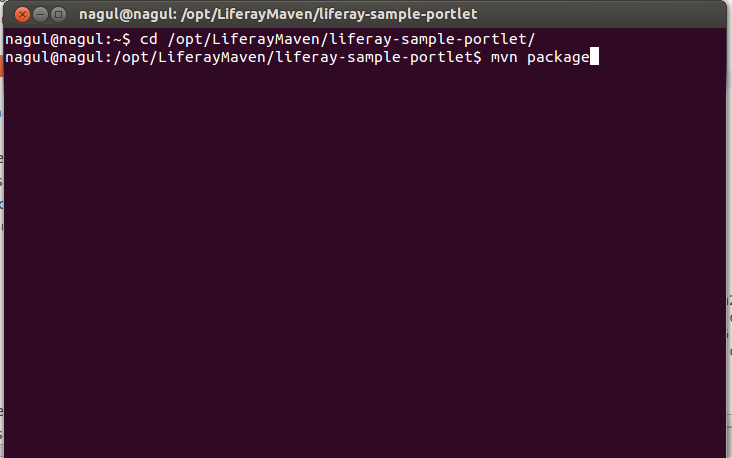 Now extract file on any of your desired location now we need to install liferay maven archetypes. Once you downloaded zip file extract in your desired location and we need to set ANT system environment variable in our machine. We need to create ANT_HOME and we need to append ANT bin path in “path” environment variable. Generally in the Linux we will use “.profile” or “bash.bashrc” file to set all environment variables. Now open .bash_profile file in editor and add following configuration then save it. Now open Linux Terminal type “ant -version” then it show ant version now you have successfully installed ANT. Also in the System variables section, select your path variable and click Edit…. Insert ;%ANT_HOME%\bin; end of the existed path value and click OK.
Click OK to close all system property windows. Open a new command prompt “ant -version” then it show ant version now you have successfully installed ANT. Well as of now we are ready with MAVEN archetypes installed in maven local repository and Liferay Portal Server now we need a development IDE to create Liferay MAVEN Project. Generally we need eclipse , Liferay IDE ,MAVEN Eclipse Plugin,Liferay IDE MAVEN Plugin. The following are the required eclipse plugins to support Liferay MAVEN Environment in Eclipse. 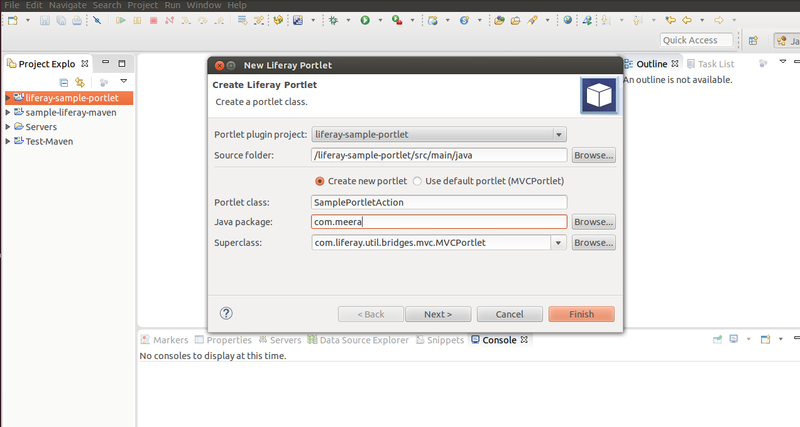 All together will be available in single package when we download Eclipse Liferay IDE from Liferay downloads. Now extract archive file in desired location then you can see root directory that is eclipse if you go to root directory then you can see eclipse icon when we double click on icon then eclipse will be started. 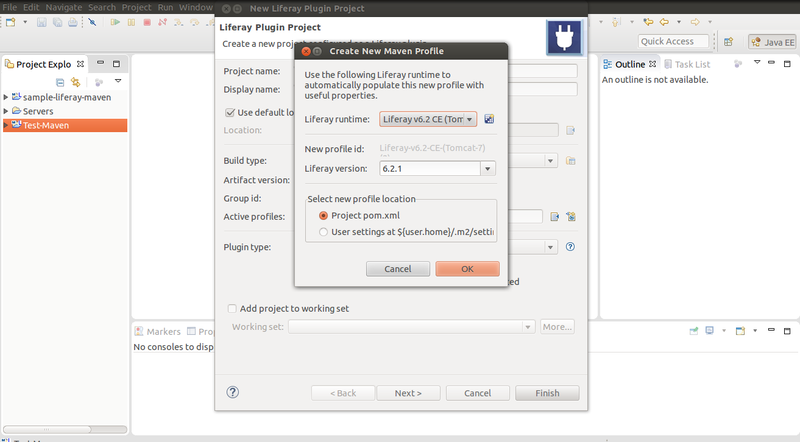 Start eclipse and select LiferayMaven is default work space. Eclipse Window → Preferences → Server → Runtime Environments. Click Add to add a new Liferay runtime; find Liferay v6.2 (Tomcat 7) under the Liferay, Inc. category and click Next. Click Browse and select your liferay-portal-6.2.x/tomcat-7.x (/opt/LiferayMaven/liferay-portal-6.2-ce-ga2/tomcat-7.0.42)directory. Once we provided the information click on finish button then Plugin portlet project will be created. In the project explorer you can see the project and every maven project have one xml file called pom.xml file there all build process will be defined. Now click on pom.xml file then you can see default all build configuration like plugins definitions, configuration and dependencies information. the above details are based on where your portal server resided. Above all dependencies should enclose by <dependencies></dependencies> tag. Now we have done all the required configuration in project pom.xml now we can deploy project. Open command prompt or terminal and go to newly created liferay Plugin project location its generally in eclipse work space(LiferayMaven) then issue following command. If portal already start then you can see Plugin deployment information in server log file. Download sample liferay maven Plugin from below link when you use this project please make sure you should installed Liferay Maven Archetypes in your local and you have to change server configuration and versions information in the pom.xml file. The configuration in pom.xml will be changed based on your environment like version number, server configuration and dependencies versions. The above maven setup we have installed maven archetypes in our local repository that is /.m2/repository. http://sourceforge.net/projects/lportal/files/Liferay%20Portal/6.2.1%20GA2/We have created liferay maven project from Liferay IDE tool without Liferay IDE also we can create liferay plugins from command prompt/terminal. We have create Pluginv portlet project apart from that we can also create all liferay plugins like hook,web,ext,theme and layouttpl from liferay maven archetypes.